An African Animal Lesson Using Informational Texts—with FREE Download! This is a guest blog post from Susanna Westby of Whimsy Workshop, and it includes a FREE download with worksheets! See the bottom of the post for the link to download, and check back frequently for more great classroom-tested ideas! If you'd like to see her other contributions to this blog, click here! Hello again! I’m Susanna from Whimsy Workshop Teaching, and today I’m sharing some examples of how I use the Into the Wild series of informational texts by Claire Vial and Graham Meadows to teach about animals. The books we used for this lesson were Zebra, Lion, Elephant, Hippo, and Giraffe. My key concepts for these lessons were African animal characteristics and habitats. We discussed these as we looked at the pictures. Our class theme for this month is Africa, so students had some background knowledge already. First, we used these books as a whole-class read-aloud, as I projected the images for the class. We studied the vocabulary and information on each page and compared the animals. We also used the books in small groups, and we took note of different animal characteristics, similarities, and differences. Students were encouraged to write down characteristics that were unique to their animal on the worksheet below. Working in small groups allowed me to guide and assist them with this task; we recorded information on the sheet. To really absorb the information from these books in a fun way, students created a book of riddles. They worked in small groups to generate clues or riddles for their animal, and then drew the animal on a small answer card. After assembling the book, students could pull out the answer card to reveal the answer. We spent a whole afternoon testing each other with our “What Am I?” riddle books! I have included a simple template as a free download, so that you can try this with your own class. Simply fold a paper in half and glue edges at the top, then fold vertically like a greeting card. Once students get the idea, they will be able to create their own riddle books for any of the animals. I’ve also included the “My African Animal Study” recording sheet for writing animal characteristics. This can be used before making the riddle books, or just on its own! I hope you enjoy them as much as my class did! I have been teaching primary grades for 20 years. My classroom is a place of hands-on, creative learning where students feel safe to make mistakes and learn from them! I live near Vancouver, BC Canada with my music-teacher husband and two teenage boys. More literacy ideas and graphics can be found on my blog, Whimsy Workshop Teaching. Download your free "My African Animal Study" and riddle book template by clicking the worksheet image below! 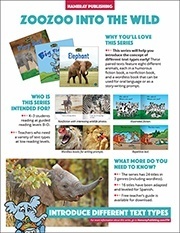 For more information on the Zoozoo Into the Wild series, click here to visit our website, or click the image on the right to download a series information sheet with highlights and key features.